These 12 Free Android Apps for Bloggers will keep you up-to-date with your blog even when you can’t be at the computer! Since making blogging my full-time job, I’ll be the first to admit that it is really hard to not constantly be in front of the computer. According to your niche and especially starting out, it feels like you have to work 12+ hours a day to stay competitive and pay the bills to be completely honest, right? Since this career is so competitive, opportunities can also often be lost because you literally didn’t see something in minutes after it was emailed to you, etc. However, life does go on and there are moments and people you don’t want to miss out on, so it’s certainly a tough balance. While I have learned to wean myself off the computer to enjoy life more and actually take time off, I still like to check in regularly. Thanks to my phone and the wide array of apps available, I can do so without it taking over my life! 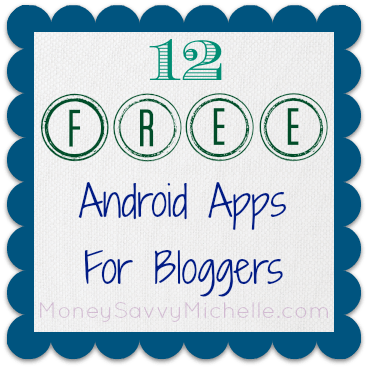 Here are 12 free Android apps for bloggers that I use daily to stay productive with my business while still enjoying all the other things life has to offer. 1. Mail App – On most Android phones 2 email apps come pre-installed, the Mail app and the Gmail app. Even though I almost exclusively use Gmail, I do prefer the Mail app. There are also apps available for Yahoo, etc. 2. WordPress or Blogger App – I pretty much never blog from my phone – it’s just too awkward. However, one never knows when the internet or power may go out, so I like to have the WordPress app installed just in case I need to post something, etc. There’s also a Blogger app if you use the Blogger platform. 3. gAnalytics – I try to not constantly check my stats constantly because I find that I get very distracted with doing so. However, if I have to unexpectedly be out and about or want to see how my traffic is doing during a night of TV and movies, I love this app to check in. The app is not officially from Google and doesn’t contain all of the data from the web version, but does contain most of the core data I seek out. There is an official app from Google that was released not too long ago, however I much prefer the functionality of gAnalytics. 4. WebRank SEO – This app has no frills, but has a lot of statistic data all in one place such as your Google Pagerank, Alexa score, pages indexed, etc. 5. Google Drive – I love Google Drive (formerly Google Documents) for keeping up with a variety of information and keeping organized. I use it for business spreadsheets, editorial calendars, etc. Since I can also access this data from my phone, it helps me keep track of any due dates, etc. I may have for the day even while on the go. 6. Pinterest – My love for Pinterest has grown a lot during the past several months as I have started to post more evergreen content (or content that is pretty much good forever, like recipes). Even though a lot (okay, most) of my pictures look pretty craptastic IMO, thanks to Pinterest my traffic has pretty much doubled in a few short months, even when this time of year is usually slow. If I have a few moments of down time while not at the PC, I’ll use the Pinterest app to see how my pins are doing or scroll through for some inspiration. 7. StumbleUpon – Though not as good of a traffic source for the site as it once was, I still enjoy using StumbleUpon for both traffic and to get to know new sites I otherwise probably never would have heard of. I much prefer going through my StumbleUpon shares with the app. 8. Twitter – If you have used Twitter, you know just how fast-paced it can be. I enjoy using the app to stay up-to-date on the latest happenings and to interact with my followers while on the go. 9. Facebook – I’ll be honest, Facebook has become a source of frustration for me over the past several months and is rather disappointing for traffic currently and I now use it at a minimum. However, I still enjoy using the app to interact with my readers that can actually see my updates and stay up-to-date with some blogging groups that I am part of for networking. 10. Google+ – As you probably know, Google+ is very similar to Facebook. So, I love being able to check in and post updates from my phone. If you haven’t jumped on the Google+ train yet, I totally suggested it. I really think it has helped triple my search traffic in the past 6 months! 11. Instagram – I haven’t used Instagram as much as I would like. In fact, I started using it more right before the whole Instagram picture selling debacle and then stopped because of it. I would like to start using it more again, but at the very least, the app provides a lot of great filters even if you don’t use the network itself. What are some of your favorite apps to use other than these 12 Free Android Apps for Bloggers? Great suggestion on Webrank SEO! Thanks, Anna. It’s still one I love to check daily! I’d love the bubble wrap app. I don’t have a smart phone so can’t use these, but I’ll keep them in mind. Thanks for sharing! I’m going to put some of these on my tablet!